There are some things that I’m just not that good at. I know. Shocker. Mastering the sauté pan flip, for one. Every single time, one good flip and bits of food are everywhere. I don’t know if I have weak wrists, a lack of confidence or just supreme uncoordination. Probably all three. That I can live with. But the one thing that drives me nuts is caramelizing onions. I just don’t have the patience and usually end up with dry, overly browned (aka “burnt”) bitter onions. Until now that is. I have finally discovered a foolproof way to caramelize onions. Alert the press! Am I the only person with this affliction? I know, it’s stupid. It’s not that I can’t caramelize onions; of course I can. I just don’t always like the result. I’ve got about a 50% success rate and most of my failures can be attributed directly to my impatience. You see, caramelization takes time, something severely lacking in my day-to-day life. I usually try to speed things up by turning up the heat and it never ends well. You think I’d learn. 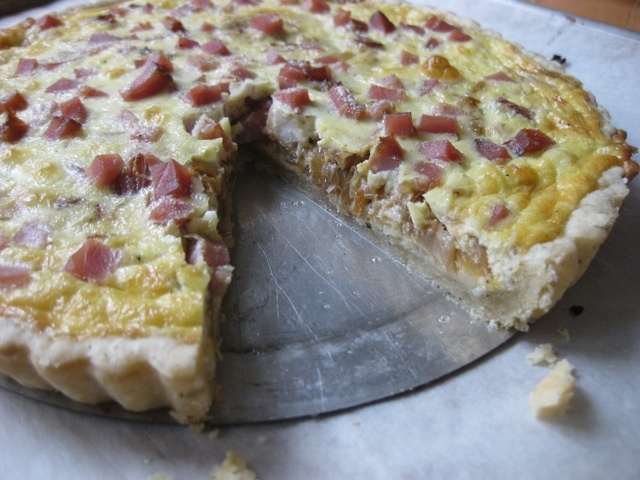 This was supposed to be a post about Quiche Lorraine, and it is, but I learned something very cool along the way. I mastered onion caramelization. Today was different because I took my time. The Bears were on, my apartment was toasty warm, big fat snowflakes were falling; it was the kind of lazy day that is made for these types of things. Yes indeed, today I was going to master those onions to honor the last little bit of holiday ham I planned to tuck into this quiche. I sliced the onions thinly and put them in a sauté pan with some butter. Over medium heat – not too hot – I stirred about until they softened and wilted. Then I did something I’ve never done before, a technique I stumbled upon on epicurious a while back while looking for something else. Here’s the trick: after softening, the pan is covered. What. The. Hell. Goes against everything I’ve ever been taught. Covering the pan. Humph. You see, I had to remind myself that sautéing and caramelizing are two different things. Sautéing requires a little fat and high heat for short periods of time to facilitate browning. Caramelization, however, is a long slow process involving the oxidation of sugars resulting in nutty flavor and brown color. By lowering the heat and covering that pan, moisture is trapped creating the perfect environment for the onions to brown ever so gently. A few stirs and in about 20 minutes I had wonderfully golden – not burned – sweet onions. Well alright alright. Nifty little technique. Old dogs can learn new tricks. So about that quiche. 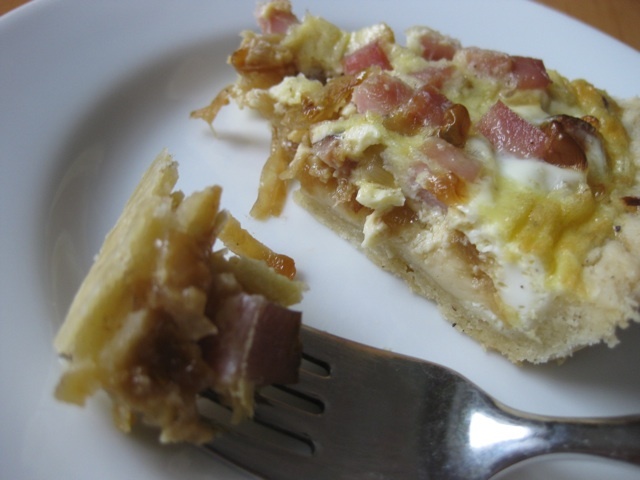 This is a classic combination: ham (or bacon), gruyere and onions held together ever so gently with a simple egg custard. It came together like many things in my life, rather fortuitous and haphazard. My refrigerator was the perfect storm of odd ingredients … cubed gruyere leftover from a party, that little bit of special ham, heavy cream left from something, and a few onions that needed to be used. As unattractive as that sounds, the sum was indeed greater than the parts. Together, they created the most wonderful thing. Into a partially baked crust I zipped up with a little black pepper, went the cheese, the beautiful onions, then the ham. A simple custard mixture of cream, milk and eggs was gently poured over then the beauty baked for 30 minutes. And it was truly beautiful; golden brown and puffy, dotted with pink little bits of ham. Those onions, the ones I’d become so proud of, added a wonderful complex layer of flavor – sweet with a bit of almost wine finish – and were meltingly tender. Not to mention, the apartment and building hallways smelled divine. STRESS BAKING THERAPY FACTOR: HIGH. 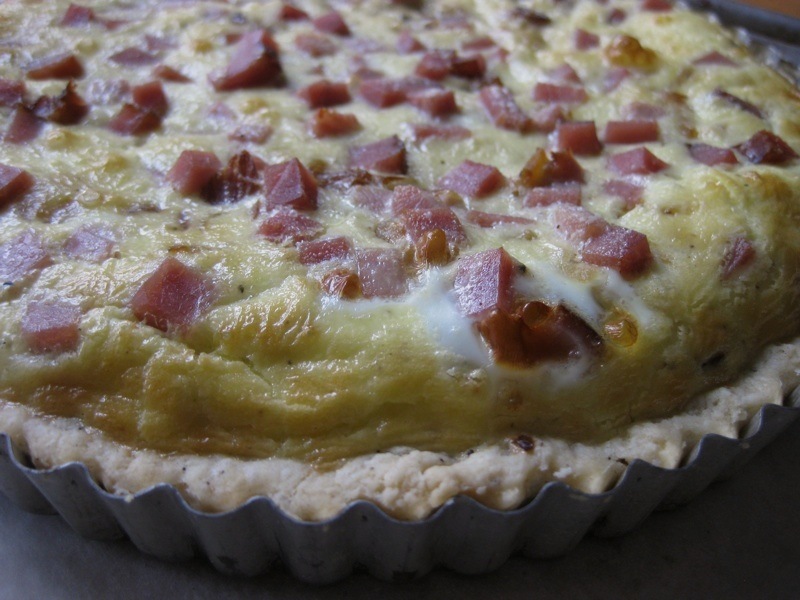 Why don’t people eat much quiche anymore? Sure, it’s a holdover from the swinging days of fern bars but it’s so delicious. And easy. The most delightful lunch is a slice of cheesy quiche with a nice green salad and a chilly glass of wine. Gifting a quiche to someone you want to impress – and I mean REALLY GOOD quiche, not awful rubbery crap – is extremely rewarding. They will look at you with googly eyes and profess their love. And if that quiche is warm when you gift it? Prepare to be trampled. I myself am personally doing my best to revive this classic dish. Right at this very moment in fact. Excuse me; I must have a second slice right now while it’s still warm. For the pastry: In the bowl of a food processor, combine the flour, salt and pepper with a couple of pulses. Add the cold butter chunks and process for 30 seconds to 1 minute until butter is broken up and the size of peas. Take care not to over-process. Add the ice water and process until dough just comes together. Resist the urge to process the hell out of it until it forms a ball. You want to stop when it’s still a bit loose and you think you haven’t done it enough. NOTE: if you want to do this with your hands rather than the processor, just rub the butter/flour between your fingers until you have pea-sized pieces. Stir in the ice water until the dough just comes together. Turn the dough out and give it a few quick kneads until it comes together. Turn the dough and loose bits out onto the counter and with your hands, give it a few kneads and turns to bring it together. Roll the dough: remove the dough from the fridge and let warm up a bit while – 5-10 minutes so it’s easier to roll. Lightly flour your work surface and rolling from the center out, roll about 1 ½” larger than your 9” tart pan. Roll the dough up onto your rolling-pin and carefully roll over the tart pan. Carefully ease the dough into the pan, making sure it fits into all the flutes but careful not to stretch too much. Place the tart pan on a sheet pan and freeze for at least 20 minutes until frozen solid. Preheat the oven to 425°F and place oven rack in the lowest position. For the onions: Add butter to a large skillet and melt over medium heat. Add the sliced onions and cook with ¼ teaspoon each of salt and ground pepper over medium, stirring, until just wilted, about 2-3 minutes. Cover with a tight-fitting lid and continue to cook, stirring frequently, until onions are very soft and golden, about 20 minutes. Set aside to cool a bit. 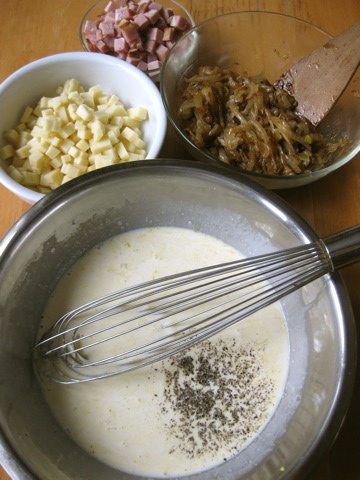 For the custard base: In a medium bowl, mix the eggs, cream (or half-and-half), salt, pepper and cayenne until thoroughly combined. Set aside. Bake: bake the frozen empty tart shell for 12 minutes until just set. 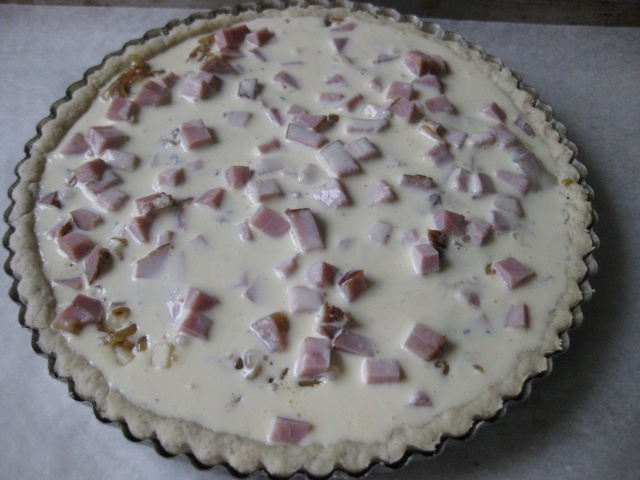 Remove from the oven and sprinkle the cheese over the bottom of the partially baked tart shell, then the onions, then the ham. 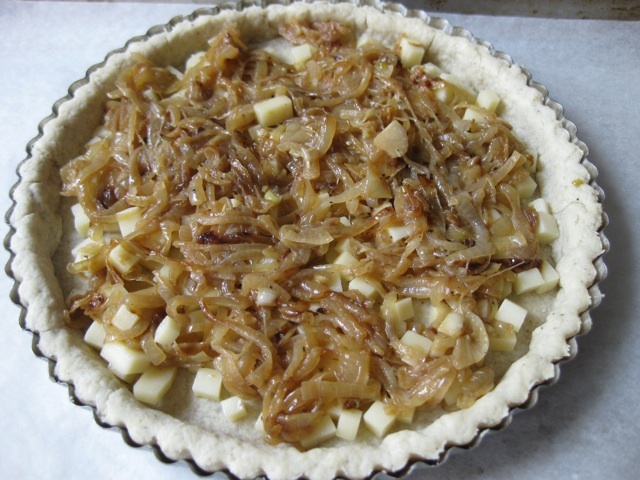 Pour the custard mixture over the filling ingredients and carefully slide the tart back into the oven. Do not overfill. Bake for 30 minutes until custard is just set and crust is golden brown. Let cool a bit before unmolding. The quiche is delicious warm but also very good at room temperature. I’ve had great success freezing individual tarts and warming in a 350°F oven right out of the freezer for 20 minutes. Not bad at all. oh. my. golly. that looks yummy! i’m right there with you sister, on the quiche for lunch with wine thing… right up there with real hot chocolate with real whipped cream. one of life’s simple pleasures! did you use your pie dough recipe for the crust or is is a different one? So making this recipe this weekend for guests! Would there be a negative flavor difference if I carmelized the onions in advance? Oh god, not at all! In fact, please do them ahead along with the crust (in the pan stashed in the freezer unbaked), and enjoy time with your guests. Dice the ham and shred the cheese ahead too and it’ll come together in a snap.